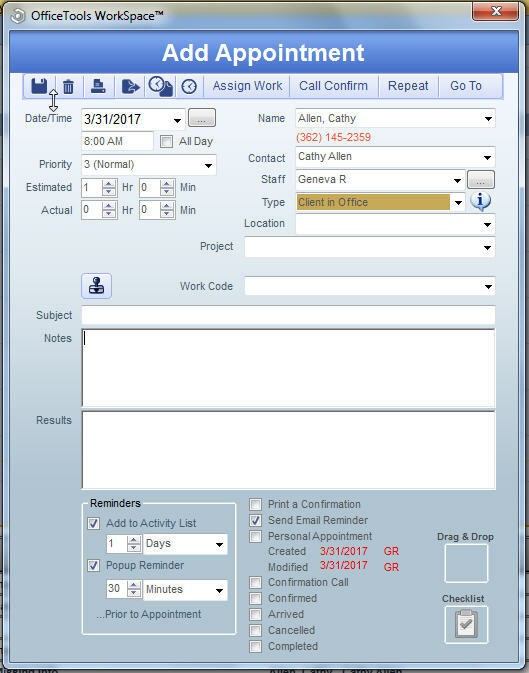 Creating an appointment in OfficeTools WorkSpace allows for placing items on the schedule(s) of a staff member or multiple staff member’s calendars. When creating appointments it is important to remember all of your options for said appointments. For example, WorkSpace allows for automated text message reminders as well as email reminders for the appointments that are created. WorkSpace also offers the option to attach documents through the Drag & Drop feature as well as associate the appointment directly to pre-existing projects that exist for that contact. Is there any way for me to see all appointments I have had with a contact in the past?